Do you want to rock your social media marketing game? Keen to learn from the legendary Guy Kawasaki? 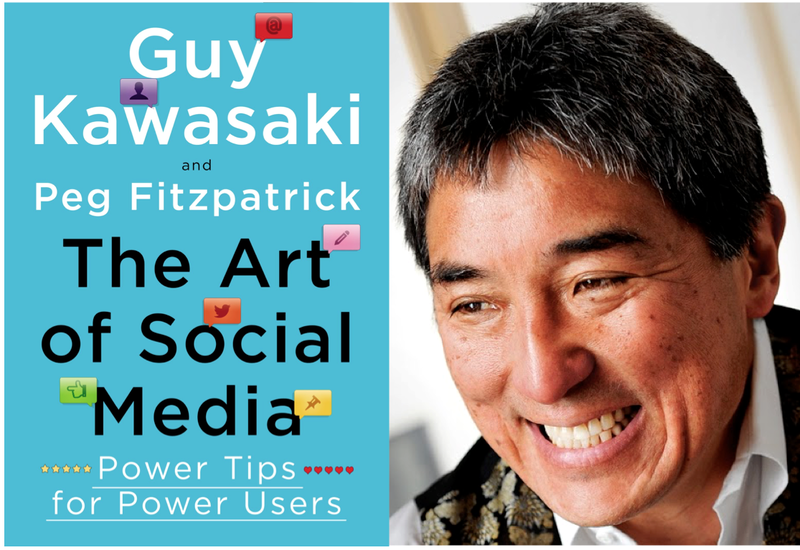 If so, check out The Art of Social Media co-authored by Guy Kawasaki and Peg Fitzpatrick. Providing over 120 “power tips for power users”, the slim volume provides practical hands-on “tips, tricks and insights” culled from Guy and Peg’s years of battle-hardened experience at the forefront of social media and content marketing. Unlike other social media marketing self-help books, this one is virtually BS free. There are no theories expounding the virtues of A versus B, no research citations from university professors, and no third party case studies from companies X, Y or Z. Instead, everything is written heart-on-rolled-up-sleeve. Narrated with Guy’s characteristic wit and candour, the book provides painstaking detail of how things are done, what works and what doesn’t. Organised into 12 sections, I love how the book begins with the art of the start, ie “How to Optimize Your Profile”. From profile photos, cover images, biographies to URLs, we are taught how to maximise our online presences on Facebook, Google+, LinkedIn and Twitter. What’s new to me was the idea of crafting a mantra – two to four words which explain why we exist. Guy’s mantra is “I empower people”, while Canva (a wonderful free design tool) uses “democratizing design” as its mantra. I guess mine would be “geek marketer”. Focused on content curation (ie finding and sharing other people’s content) as opposed to content creation, the book describes a system of planning, calendaring, finding, and sharing of posts on social media. To find the right content to share, you could use curation and aggregation services (eg Alltop, Buffer, Feedly, Reddit), trawl lists, communities and groups (eg Google+ communities or LinkedIn Groups), or look at what’s hot and trending. Once you’ve located the right content to share, you need to preen, polish and package it in the form of a shareable post. Real life events – From hashtags (use an evergreen one like #coolerinsights) and photo corners to live tweets, conferences are great opportunities for social sharing. Google+ Hangouts – An entire section is dedicated to powering your live video chats on Google+. Includes the equipment to get, colours to wear, and the creation of trailers and event pages. Plus a nifty checklist! Twitter Chats – Ditto for Twitter, where everything from hashtags to speed of typing is covered. Google+: Check how your post looks, use comments and +1s to run polls, use replies to generate attention, and stylize your text. LinkedIn: Write a personalised connection request and keep it serious (duh). Pinterest: Rotate your Pinterest boards, add categories and descriptions, share your pins with other social networks. Slideshare: Differentiate between a powerpoint slide and a slideshare – your audience is not around to hear you present! Also, ensure that your title, category and tags are well crafted. Pragmatic and fluff-free, The Art of Social Media is a must-have for anybody keen to use social media for business. Candid and unabashed, its approach to social media marketing requires a significant amount of discipline, determination and diligence. Admittedly, not everybody can do what Guy and Peg can do. After all, both authors are stalwarts in the social media spaces, especially Guy – the former chief evangelist for Apple. However, there are certainly gems in the book worth considering. Will you join me in grabbing a copy of this book and applying its principles? For more information, check out The Art of Social Media website here.